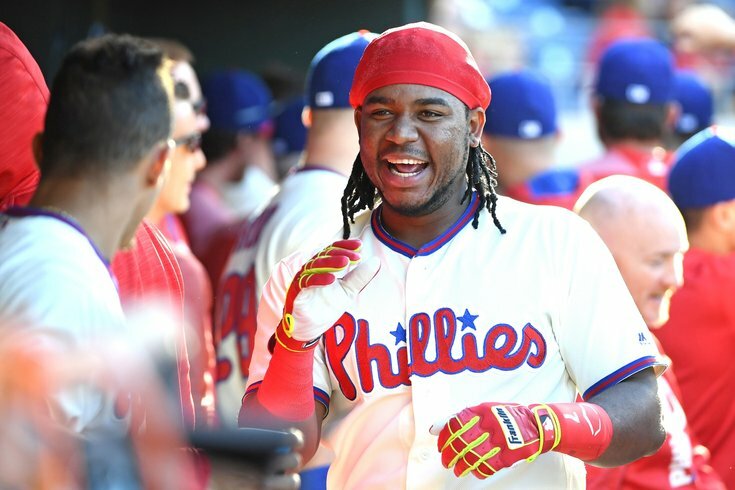 Philadelphia Phillies third baseman Maikel Franco (7) celebrates after hitting a three run home run during the fourth inning against the New York Mets at Citizens Bank Park. Good news, cord-cutting baseball fans: Facebook just struck a deal to exclusively live-stream 25 afternoon Major League Baseball games in the United States. Better yet, Philadelphia fans without a cable or MLB Network subscription won't have to wait long to see the Phillies play in one of them. The agreement will mark the first time a major U.S. league will have its games exclusively streamed on Facebook, which has worked to ramp up its live sports offerings in recent months. The Phillies will play in two of the first four games under the deal. They'll be featured on Facebook's first stream when they take on the New York Mets on April 4 in a Wednesday matinee at Citi Field, and again on April 26 when they host the Arizona Diamondbacks at Citizens Bank Park. The league also announced that Facebook will stream a matinee on April 11 between the Milwaukee Brewers and St. Louis Cardinals as well as an April 18 matchup between the Kansas City Royals and Toronto Blue Jays. Each set of monthly broadcast schedules for Facebook will be announced throughout the season. "This partnership with Facebook reflects the ongoing commitment of Major League Baseball and our Clubs to connect with people around the world," Tony Petitti, the league's deputy commissioner of business and media, said in a statement. "It is a major creative step forward in serving our diverse, passionate community of fans, who will enjoy a uniquely interactive experience watching our games on Facebook each week." The financial terms of the deal are private and were not disclosed, but people with knowledge of the agreement who spoke with Bloomberg put its worth between $30 and $35 million. All league owners unanimously approved the move, according to an announcement from Facebook and MLB. Viewers will be able to watch the games on their smartphones, tablets, computers and connected devices like home TVs, Bloomberg reported. The broadcasts will be produced by MLB Network, which will, in turn, introduce in-game production elements catered to watching, sharing and interacting on Facebook during games, according to the release. Facebook had non-exclusive rights to simulcast 20 local MLB broadcasts on Friday nights last season. See more on the agreement here.